Every year, millions of people walk through Costa Rica on a pilgrimage for miracles. Their destination is the Basilica de Nuestra Senora de los Angeles (Cathedral of Our Lady of the Angels) church in Cartago, which was built on the site of a miracle from 1635 involving a statue of the Virgin Mary and Jesus Christ (called La Negrita) and holy water from a spring there. This massive prayer walk -- called the Procession of the Miracles -- results in body and soul healing for many people, believers say. Juana Pereira, a mestizo girl (one parent was an indigenous Costa Rican and one was a Spanish colonist) went to the forest near her home to collect some firewood. While there, she noticed a small carved stone statue sitting on top of a rock. Juana thought the statue would make a fun doll to play with, so she took it home and put it in a jewelry box. The next day, back in the forest, Juana was surprised to find the statue where she had discovered it the day before. She took it back home -- and this time she locked it inside the jewelry box. Somehow the statue still moved out of the box and into the forest yet again the next day Juana collected firewood. By this time, Juana suspected something supernatural was happening -- perhaps angels kept carrying the statue back to the rock, to draw attention to the spring of water that gushed out of the ground around it. She decided to take the statue to her local priest, Father Baltazar de Grado, and see what he could figure out. The day after Juana gave the statue to Father de Grado, it disappeared from the box he had placed it in and appeared in the forest, on top of the rock where Juana had originally found it. Father de Grado brought the statue to his church's sanctuary, only to have it inexplicably return once again to the rock by the spring in the forest. That was enough to convince all the local priests to build a small church at the site of the forest spring. The statue and the place where it was discovered became symbols of hope and healing as people traveled to the forest church to pray there. Human rights and race relations were key issues that improved in Costa Rican society as a result. In the 1600s, as Spaniards who had colonized the country married indigenous people, their mestizo (mixed race) children were harshly mistreated in their society. The statue -- about 8 inches tall and comprised of three different types of rock that don't naturally mix (jade, graphite, and volcanic rock) -- features an image of the Virgin Mary with mestizo features. It's called La Negrita (which means "dear black one") because of it's dark coloring. Mary looks forward as she holds baby Jesus, and Jesus places one of his hands on her heart. The carved stone statue seems to be saying that Mary's love for all people as a heavenly mother can lead believers forward to faith in Jesus and healing through his power. That message has united the people of Costa Rica through the years. More and more people visited the site to pray as time went on. Several churches were built there until the largest (the current one) was constructed in the early 1900s. The tradition of walking to the church every year on the anniversary of when Juana first found the statue on August 2, 1635 began after Pope Pius IX declared Mary the patron saint of Costa Rica in 1824 and encouraged believers to honor her as the "Virgin of the Angels." In 1862, the same pope declared that every person who makes a pilgrimage to pray at the church would receive complete forgiveness for their sins from God. Now, August 2nd is a national holiday in Costa Rica, and nearly 3 million Costa Ricans and residents of neighboring countries participate in the pilgrimage. 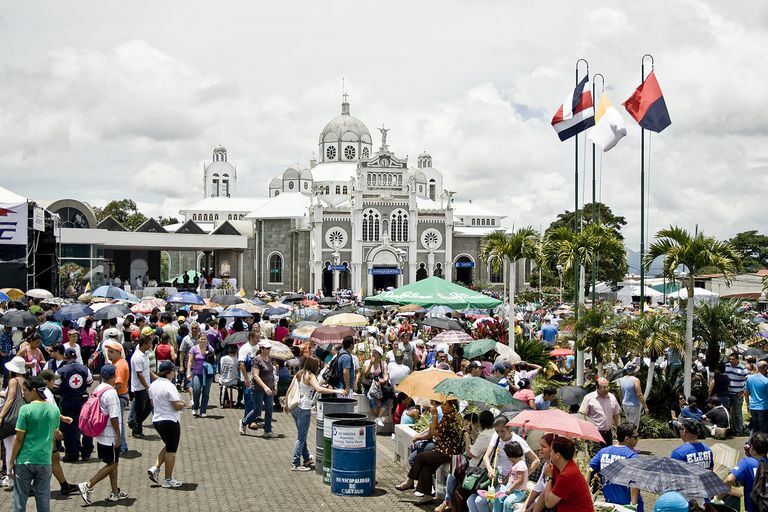 Many of them walk from Costa Rica's capital city, San Jose, to the church in Cartago (a distance of about 16 miles, which usually takes about 4 hours to walk). Entire families -- from infants to senior citizens -- often travel together, and some people crawl to the church on their knees as a way of expressing humility before God. While pilgrims arrive, they confess and turn away from their sins, receive God's forgiveness, and present requests for God to intervene in their lives with his miraculous power. They may pray for physical miracles -- such as recovery from an illness or injury -- or spiritual miracles, such as the restoration of a broken relationship with a loved one or the provision of something they need for a better life (like a new job). Pilgrims use holy water from the spring outside the church -- the same spring that the statue called attention to in 1635 -- as a tool to conduct the energy of their prayers to God. They either drink the water or splash it on themselves while praying. Believers say that the water has carried the energy of God's answers to their prayers back to them, leading to more miracles happening. Archangel Gabriel, who serves as the angel of water as well as God's top messenger angel, may be supervising the process along with Mary (the queen of angels) believers say. Pilgrims return to the church on a regular basis to express their gratitude for how God has answered their prayers. They light candles in the sanctuary, where the statue sits in a golden case above the altar, and contribute items to the church's museum that symbolize the specific type of prayers God has miraculously answered in their lives. The museum is full of pendants in the shape of what they represent: body parts (such as hearts, kidneys, stomachs, and legs) that have been healed, homes where relationships have improved, office buildings that symbolize business success, and even planes and boats to commemorate special trips that God gave them opportunities take. Other tangible reminders of God's blessings in the museum include letters, photos, and locks of hair. The small La Negrita statue continues to inspire a large expression of faith and miracles in Costa Rica.